Our first day in the Hunter Valley, NSW was spent driving around getting our bearings, and checking out the location of the wineries. We ate that night at SSS BBQ Barns in Cessnock — I had the chicken and ribs (pictured below) and my husband had the sampler plate. He also had dessert (toffee basket with macadamia nut ice cream and berries), though I don’t know how he fitted it all in. On the second day we started at the Small Winemakers Centre (MacDonalds Rd). What a brilliant idea! It was a one-stop tasting centre for several small wineries, many of which don’t have their own cellar door or who can’t compete with the big players, with their fancy restaurants, golf courses, resort accommodation etc. We bought a sample pack of six red wines — it should arrive next week when we’re home again. Our next stop was a place we visited last time we were in the Hunter — Piggs Peake winery (Hermitage Rd). We spent a good hour here, sampling most of their extensive range of red wines and talking at length to Steve (the winemaker) and Rob (his assistant). Oh, and tasting various blends of their zinfandel, which is still in the barrel. The Audrey Wilkinson Vineyard (Debeyers Rd) was next. This winery was atop a high hill, with 360 degree views all round. Just as we arrived, a couple were leaving with their wine — and their pilot — heading to their helicopter on the lawn! Now there’s a way to get around with a non-drinking skipper 😉 It seems some local companies offer this service. Our next stop (yes, I was driving so I was sipping and spitting!) was the Capercaillie Wine Co (Lovedale Rd). They had some superb red wines, particularly their shirazes and Cab Sav. We bought a bottle of ‘The Gillie’, their top-of-the-range shiraz, for dinner that night. Our last stop was Petersons Wines (Mount View Rd), which also had some lovely reds. Dinner that night was at Indian@Hunter (Vincent St, Cessnock), where we had the Chennai Chicken (we asked for it ‘very hot’), Goan Beef Vindaloo (asked for ‘hot’), rice, and cheese naan. The food was EXCELLENT! 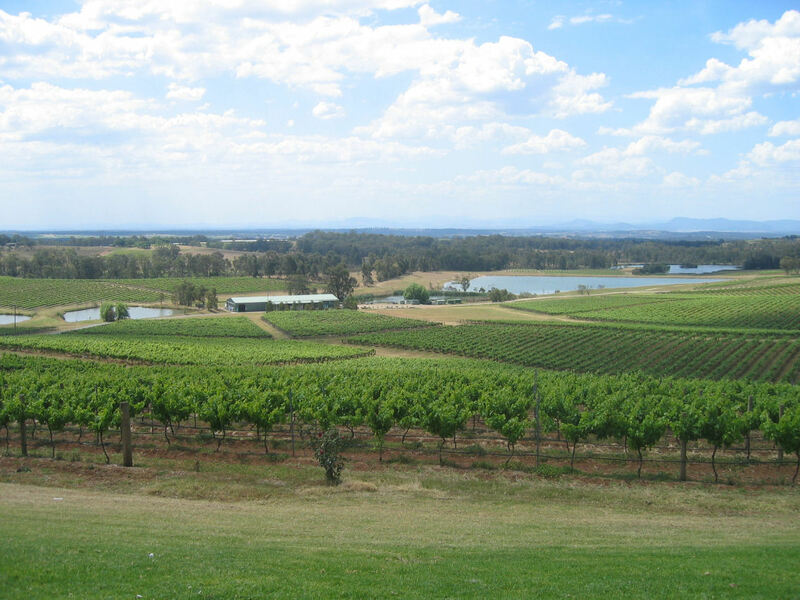 Tomorrow we head back to Sydney, having spent a relaxing three days in the Hunter Valley. BTW, we stayed in Cessnock at the Wine Country Motor Inn, right in the heart of Cessnock and only a few minutes’ drive from the Hunter Valley. Much cheaper than staying in the valley itself at the expensive resorts. We visited the Small Winemakers Centre when we in the Hunter last year for my sister’s wedding, great fun!